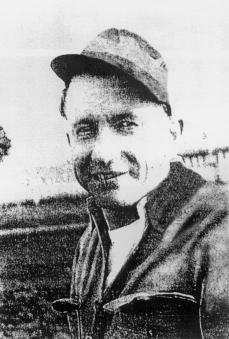 George Marback was born on April 2, 1924 to Mike and Anna (Senger) Marback of Bismarck, both immigrants from Russia. He is the second oldest child among older brother Mike Jr., and two sisters Betty (Bahmiller) and Lillian (Sims). At age 10, he earned 8 cents an hour pulling weeds and picking onions for Oscar Wills Seed House. His first venture into the kitchen had came at age 12 when he got a job at Frank's Place, run by Margurite and Frank Clausen. It was a job and a chance to learn a trade in the midst of the Great Depression. While initially he was limited to peeling potatoes and washing dishes, he was cooking by age 16. 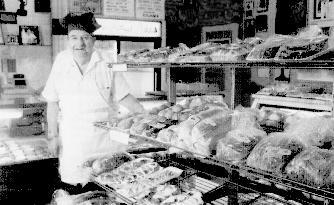 George eventually converted that experience into a better job with the Sweetheart Bakery in Bismarck. But after war was declared in December 1941, George answered his country's call for military service the following month, enlisting in the Navy at age 19. Staying true to his career aspirations, he became a ships cook. His prior experience allowed him to pass his exams and advance rapidly in rank ultimately to Chief Commissary Steward. While in the service, he was attached to the 3rd Marine Division and was sent to Okinawa on April 1, 1945, where he was under fire for a total of 82 days during the seige. While he was primarily a cook, during the seige, he and his fellow sailors did whatever was necessary to defend their position, retreive and treat the wounded. He also served in Nagasaki, China, Shanghi, Guam, Pearl Harbor. He contracted malaria during his service. George was awarded two Presidential Citations, the China Service Medal, American Campaign Ribbon, Asiatic-Pacific Campaign Ribbon with one Bronze Star and the World War II Victory Ribbon. Upon his honorable discharge from the US Navy in November 1946, George returned to the state and his job at the Sweetheart Bakery. But in the fall of 1947, he was transferred to their Midwest Bakery on Mandan's Main Street. He was promoted to site manager in 1949. He remained in the position even through a change in corporate ownership when Interstate Bakery bought out Sweetheart in 1962. Interstate divested itself of all local retail bakeries only a year later. George and his wife Virginia bought the Mandan operation in May 1963 and renamed it "George's Bakery." They offered a variety of breads, kuchen, batters for Tom and Jerry and hot butter drinks, and of course, doughnuts. Their workweek stretched from Monday to Saturday 5:00 to 11:30 AM each day with a return from 4:00 to 6:00 PM to finish the bookkeeping and return phonecalls. The person George claims most influenced his life was the former president of Sweetheart Bakery, Warren Whiston of Bismarck. A contemporary of Harold Shafer, Whiston is credited as being generous to his employees with praise and recognition. "He was just a good man, he made you want to work hard at the job, " says Marback. George Marback was extremely active in Mandan's American Legion post and was on the orginal building committee. He also served on the fundraising committee to raise $150,000 to build the new rodeo grounds in 1985. He served on the Rodeo Committee in 1966 and 1967, the two years the Legion spearheaded the event. 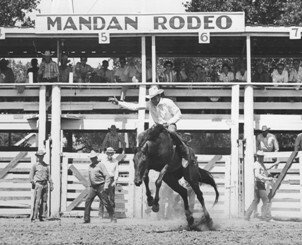 The Rodeo fell victim to rain both years, posting a financial loss of $22,000 and forcing a one year hiatus for the event in 1968. The Mandan Jaycees resurrected the event, but not without help from George, Del Skjod and the Mandan Chamber of Commerce who raised $5,000 toward the effort. George was untiring in his promotion of Mandan and efforts to improve our quality if life. He served on the original American Legion Building Committee in the early 1950s and was a member of the Mandan Rotary Club. He and Virginia were recognized for their contributions to Mandan by being selected as the Rodeo Days Parade Grand Marshals in 1995. George and Virginia Rose Shea had been married on August 30, 1948 in Mandan. Together they reared two daughters; Patty (Lies) and Mary (Scott) and operated the bakery for over 4 decades. Virginia and George retired in 2006 and moved to Wahpeton ND be closer to their daughter Patty, her husband and their grandchildren. Virgina died in Wapheton on August 17, 2008. George died on January 24, 2009. Both are buried in The ND Veteran's Cemetery south of Mandan. So how then to best to summarize his life? When asked in 2008, of all the foods and all the breads and pasteries he had ever prepared which did he most enjoy cooking? "Kuchen" he says without hesitation. A piece of love to share. The Mandan Historical Society appreciates George Marback's participation in the program. Cathy Langemo was instrumental in developing this Legacy Program biography by providing a major portion of the research materials. The Society appreciates her contribution to this article.